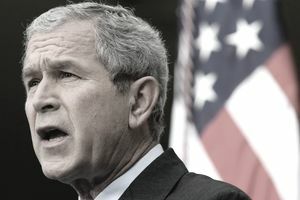 The Bush administration received Congressional approval for its $168 billion economic stimulus package in 2008. President Bush signed the Economic Stimulus Act of 2008 on February 13, 2008. He wanted to prevent a recession. The 2006 housing market slowdown had affected the economy. In September 2007, Libor rates began rising above the fed funds rate. That meant banks were afraid to lend to each other. They had too many subprime mortgages on their books. Many held mortgage-backed securities that had become worthless. Bank reliance on derivatives to boost profits would lead to the 2008 financial crisis. In fact, derivatives were the major cause of the 2008 financial crisis. Individuals would receive up to $600. Married couples would get up to $1,200. Those with children would be sent $300 per dependent child. The Bush stimulus sent 20 million retirees on Social Security and disabled veterans a check. Individuals received $300 each while couples received $600 if they earned at least $3,000 in benefits. But those who were only on Supplemental Security Income did not receive checks. The Bush stimulus also raised loan limits for Fannie Mae, Freddie Mac, and the Federal Housing Administration. The government-sponsored agencies could take subprime mortgages from banks' balance sheets. As the agencies took on the toxic debt, it started to overwhelm their balance sheets. Later that year, Fannie and Freddie went bankrupt. The package was intended to save businesses $50 billion. They could deduct an extra 50 percent off new equipment purchases. Small businesses benefited from high expense allowances. The Bush stimulus program totaled about 1 percent of the gross domestic product. Advocates of the bill said that was large enough to impact the $14 trillion economy. Most economists agreed that tax rebates would immediately lift consumer spending. Rebates that targeted low-income families would work even better. They are more likely to spend it than save it. For example, the 2001 rebate checks increased total consumption by 0.8 percent in the quarter that the checks were received and 0.6 percent in the subsequent quarter. The business tax relief gave companies an incentive to expand that year. But the incentive wasn't enough to create new jobs. Companies were too panicked by the 2008 financial crisis. Rebate checks are better than tax cuts. According to estimates by Economy.com, each rebate dollar spent generated $1.19 in additional GDP. Reductions in tax rates produced only 59 cents additional GDP per dollar spent. By the time the checks arrived in taxpayers' hands, it was late summer. It was too late to affect the first half of the year. It was also too late to prevent the recession. By that time, Fannie Mae and Freddie Mac were nearing bankruptcy. These two either held or guaranteed half of the nation's mortgages. On July 22, 2008, U.S. Treasury Secretary Henry Paulson asked Congress to allow the Treasury Department to guarantee $25 billion in subprime mortgages held by Fannie and Freddie. The news sent their stock prices plummeting, effectively wiping them out. On July 23, Congress authorized the Treasury to bail out and nationalize them to save the U.S. housing market. The Treasury had to purchase $187 billion of their preferred stock and mortgage-backed securities over time. This made the Fannie and Freddie bailout the largest one in U.S. history. Even if the checks had arrived sooner, they wouldn't have made much difference. Tax rebate checks are not an efficient way to stimulate the economy. The biggest impact is made by increases in unemployment benefits. They produce about $1.73 in demand for every dollar spent, according to the Economy.com study. Perhaps most important, the tax cuts weren't balanced by a decrease in government spending. As a result, it created a $500 billion budget deficit. By the time Bush left office, the federal debt had doubled to $10 trillion. A large sovereign debt will weaken a country's currency. Sure enough, the dollar weakened as the debt grew larger. As a result, oil prices rose, creating inflation over the long run.